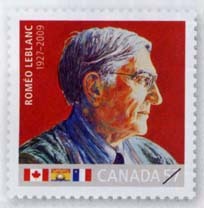 Canada Post began issuing a stamp on February 8th, 2010, honoring the Right Honorable Roméo LeBlanc, former Governor General of Canada (born 1927-deceased 2009). Roméo LeBlance served as the nation’s 25th Governor General, taking over from Adrienne Clarkson. He was Canada’s first Governor General of Acadian heritage and to hail from the maritimes. Roméo LeBlanc died in New Brunswick following a battle with Alzheimer’s disease. His state funeral took place on July 3rd, 2009.